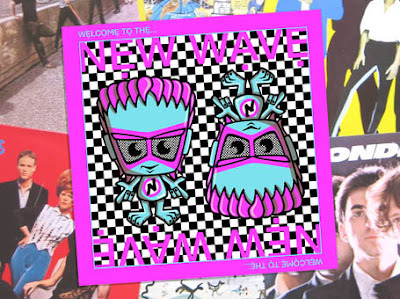 KawaiiPunk - Kawaii Mascot Blog: A New Wave Album for a New Wave Mascot! I was very glad to hear you liked the album cover I sent you earlier this month. (Re. A Punk Album for a Punk Mascot!) In fact I was so glad, I decided I’d have a go at creating another. At first I thought about creating another punk album but, when I read on the KawaiiPunk website that June will see the arrival of the New Wave Mascot, I decided I’d go for something a bit different this time. Can you guess what it is? Yes, that’s right, it’s a New Wave album! Featuring, somewhat unsurprisingly I’ll admit, your brand new colleague the New Wave Mascot as its cover star! Looks good, doesn’t it? Anyway, I was hoping you could pass this on to the New Wave Mascot when he arrives at KawaiiPunk by way of a welcoming present. I think he’ll enjoy it! And who knows, if any other musical mascots join your ranks, maybe I’ll get a chance to make some more album covers! Hey Grotty, nice to hear from you again! Thanks for the album cover - I’m sure the New Wave Mascot will love it! And regarding other musical mascots, aren’t you forgetting the Metal and Disco Mascots?